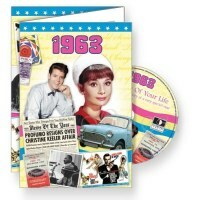 1988 A Time to Remember Greetings Card and 20 track CD. 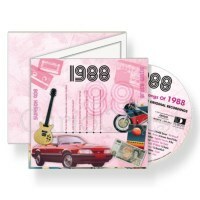 Perhaps the most unusual and treasured gifts around - 20 Original hits from the year 1988, presented on a CD and mounted in a quality 3-part, gate-fold, GiftCard, complete with envelope (GiftCard, CD, and white envelope, are all sent in a protective outer). 1. Deacon Blue - Real Gone Kid. 2. Billy Ocean - Get Outta My Dreams. 3. Prefab Sprout - The King Of Rock & Roll. 4. Beatmasters - Rok Da House. 5. Fairground Attraction - Perfect. 6. Terence Trent D'Arby - Sign Your Name. 7. S'Express - Theme From S'Express. 8. Rick Astley - Together Forever. 9. The Stranglers - All Of The Day And All Of The Night. 10. Coldcut - Doctorin' The House. 11. Freiheit - Keepin' The Dream Alive. 12. Bangles - Hazy Shade Of Winter. 13. Taylor Dayne - Tell It To My Heart. 14. Bros - When Will I Be Famous?. 15. Roachford - Cuddly Toy. 16. Bomb The Bass - Beat Dis. 17. The Primitives - Crash. 18. Pasadenas - Tribute (Right On). 19. The Four Tops - Loco In Acapulco. 20. Gloria Estefan - Anything For You.